A healthy diet should be naturally colourful! You know how there are those few times during the year when everyone around you seems to be getting sick? Well, I am going through one of those times right now and I am proud to say that I still have not fallen sick. I have been taking preventative measures to ensure I remain cold/flu-free. In addition to taking oil of oregano daily while so many are sick around me, getting an adequate amount of sleep every night, and always staying hydrated, I have been having my “ManGO-Away-Cold-and-Flu” salad for dinner quite often lately. 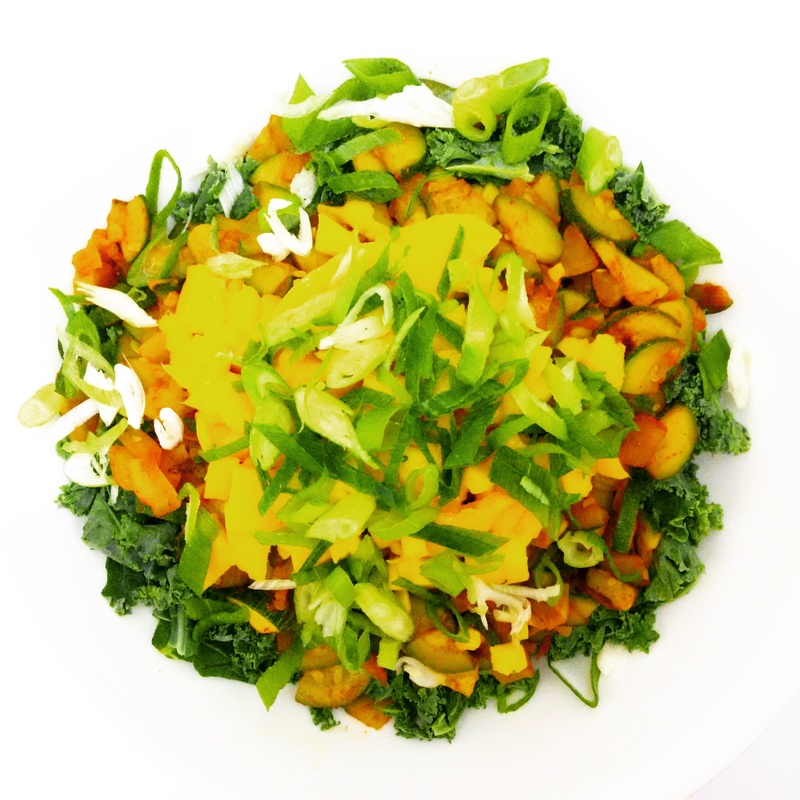 This high-in-vitamin-C and antioxidant-rich salad helps keep sickness away and is so yummy! I make this salad so often that I have never measured any of the ingredients. However, while making this salad for dinner last night, I measured the ingredients so that I could share the recipe with you all today! Enjoy! One of my secrets to making a great tasting salad is using all organic ingredients! Organic produce just tastes better. If you are a salad lover like me, this recipe serves one. In a medium frying pan over medium to high heat, sauté the diced onion in coconut oil until translucent. Add the diced zucchini and spices (cumin powder, fine sea salt, chili powder, garam masala powder, and turmeric powder). Sauté everything until all the water that comes out from the zucchini evaporates. 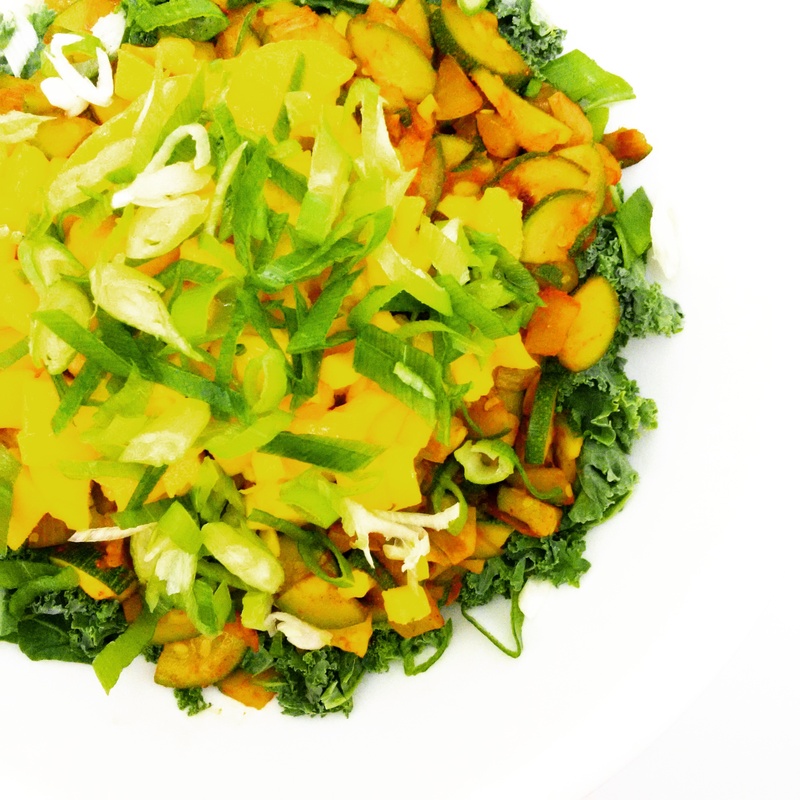 Place the chopped kale leaves in a large bowl and add the sautéed zucchini and onion mixture on top. 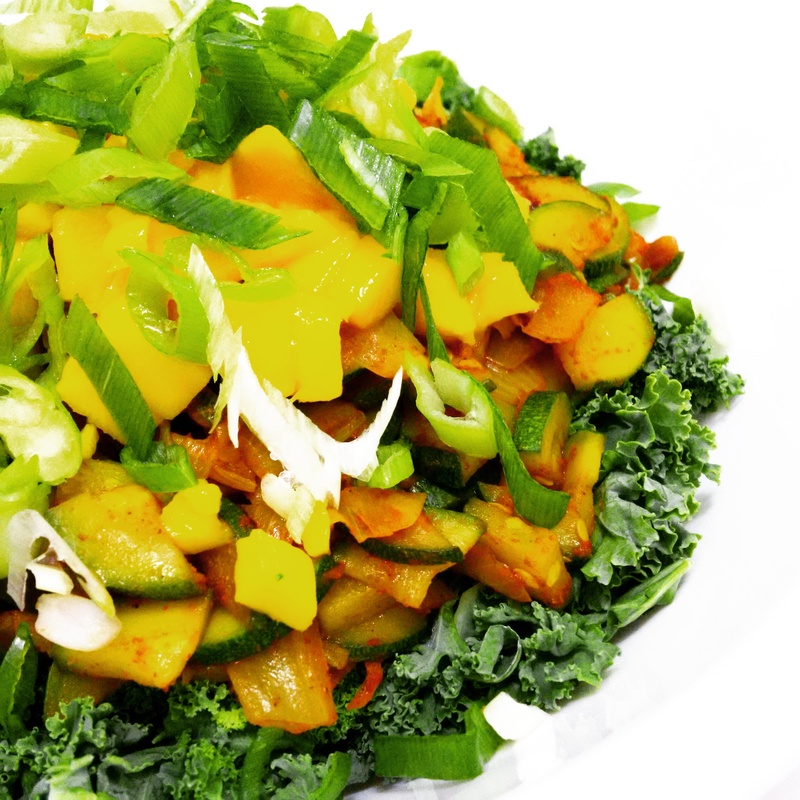 Top off the salad with the diced mango and chopped scallion. Mix everything together. Allow the flavours to mix and mingle for 5 minutes and then enjoy! Making Raj Keep the Cold and Flu Away Naturally… with Oil of Oregano! With a lot of stuff coming up for Raj and me and with many people getting sick around us, we both really need to take preventative measures against the cold and flu. So I introduced Raj to oil of oregano, which is a great, natural antimicrobial for warding off illnesses. This immune-supporting oil is usually made by extracting the essential oil from oregano leaves via distillation and then, diluting the extracted oil with olive oil (usually in a 1:3 ratio, respectively). The one we use by St. Francis is one of the more potent ones out there; the essential oil from oregano leaves is diluted with olive oil in a 1:1 ratio, respectively. Thus, ours tastes very strongly of oregano with a strong, lingering aftertaste. It also gives a slight burning sensation in the mouth. For these reasons, Raj hates taking it, but I still make him. He’ll thank me later. Yes, oil of oregano has a strong, unpleasant taste and it slightly burns the mouth, but it’s good for your immune system, Raj! I’m just glad this M.D. is open to my more natural and holistic health remedies. Do a steam inhalation with oil of oregano to combat respiratory infections. Fill a glass bowl with steaming water and add a few drops of the oil into the water. Place your head over the bowl and cover the back of your head with a towel to trap the steam. Breathe in the oil-of-oregano-infused steam. Make a moisturizing hand sanitizer with oil of oregano. Add several drops of the oil to every 100 grams of coconut oil, shea butter, or your favourite natural moisturizer. Mix well and use as needed to moisturize and sanitize your hands. Make a mild household surface cleaner with oil of oregano. Add a full dropper of oil of oregano to two cups of water in a spray bottle. Shake well and spray onto hard surfaces for everyday cleaning. Use oil of oregano as a spot treatment for the skin. In addition to the oil’s antimicrobial properties, oil of oregano also has anti-inflammatory properties, which makes it great for spot treating pimples, blemishes, acne breakouts, and rosacea. You can use it directly on affected areas. However, if direct application is too strong, you can dilute it with some aloe gel. 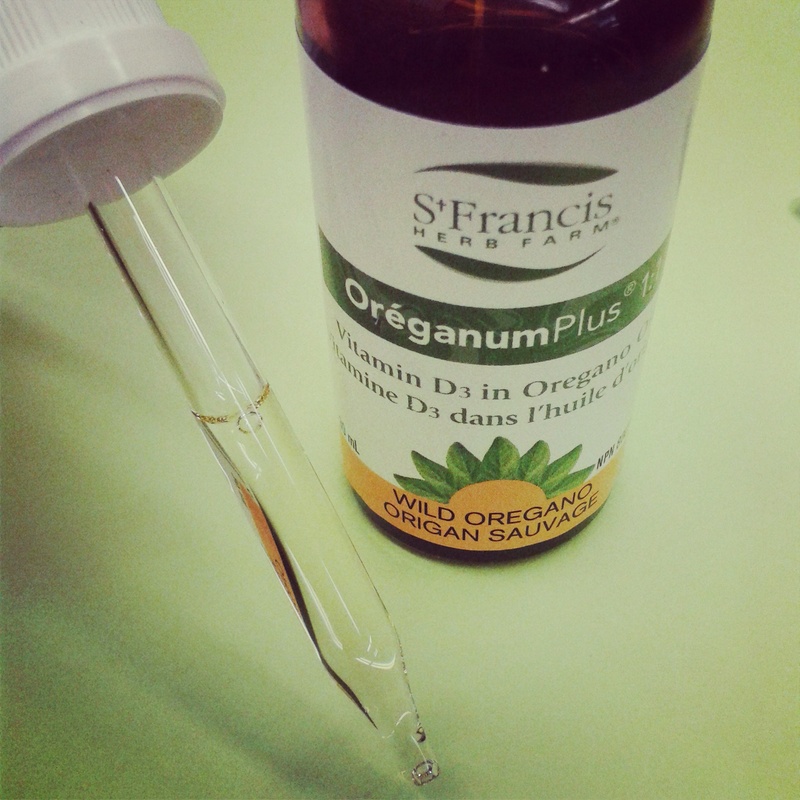 The oil of oregano that we use is the St. Francis Oréganum Plus 1:1. It’s one of the more potent ones out there (one part essential oil of oregano leaves to one part olive oil). These are just my top uses for oil of oregano, but I’m sure there are many others. It’s a great supplement to have on hand, especially during the cold and flu season. When taking it orally, the recommended dosage is usually a few drops daily under the tongue or mixed with water. We, however, take a full dropper daily under the tongue. Once you get used to it, it’s really not that bad (although Raj would probably beg to differ). 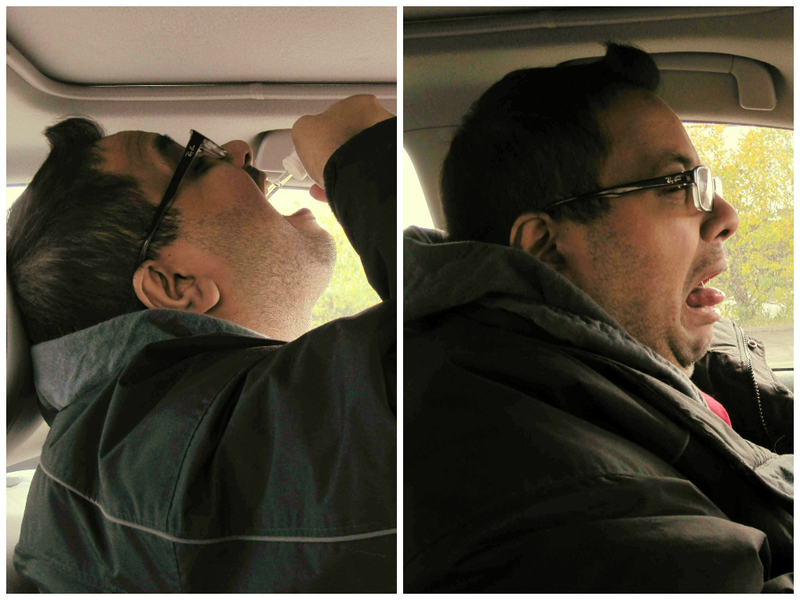 In the pictures above, we took a full dropper just before heading off to a farmers’ market. What a fun day that was! We will share our adventure at the farmers’ market that day in our next blog post, so stay tuned!